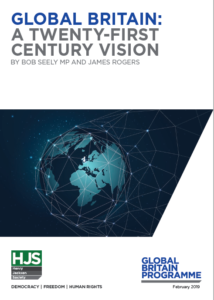 In this report, Bob Seely MP and James Rogers ask how the United Kingdom (UK) might strengthen its global role and position. They argue that flesh needs to be added to the skeleton of “Global Britain”. They believe this can be achieved through the development of a British global policy that reflects the United Kingdom’s (UK) own historical development and national culture and institutions. Consequently, the two authors claim that British global policy should be structured around the promotion of three great, fundamental freedoms: Freedom for Trade, Freedom from Oppression, and Freedom of Thought. They believe these three freedoms will be essential for democratic nations to prevail in the more competitive world of the twenty-first century. More specifically, the two authors argue that Global Britain should re-engineer its departments of state, paying particular focus to the Foreign and Commonwealth Office (FCO), the Ministry of Defence (MoD), the Department for International Development (DfID), and the Department for International Trade (DIT). They believe DfID and the DIT should be rolled into the FCO as new agencies to improve departmental integration in Whitehall. Meanwhile, they argue that a National Strategy Council should be established (effectively consuming the pre-existing National Security Council) to provide greater strategic direction. This new National Strategy Council should draw up a National Global Strategy to better integrate the work of the FCO and MoD, among other parts of government. The report concludes by offering a number of suggestions as to how Global Britain might strengthen its global role and position in the twenty-first century, from promoting greater cooperation with Australia, Canada and New Zealand (the so-called “CANZUK” group), to refocusing Britain’s strategic posture on the European continent, particularly in defence of freedom in Ukraine. What is Global Britain: A Twenty-First Century Vision? This report is an attempt to add substance to the idea of Global Britain, first articulated by Prime Minister Theresa May and the then Foreign Secretary, Boris Johnson, in 2016. It answers the question “What is Global Britain?” by setting out strategy, structure, spending and policy ideas. It aims to help stimulate debate about Britain’s role in the world. What are the report’s primary arguments? It explains why and how Britain should “do strategy” better and outlines three global campaigns for the UK to adopt – Freedom for Trade, Freedom from Oppression and Freedom of Thought – based on British culture, values and history. It argues for changes in structure in ministries to enable Britain to better integrate strategy and deliver overseas policy – and power – more effectively. It argues for a change in spending priorities. In particular, it argues that some “international development” spending should go to fund UK peacekeeping operations and the BBC World Service, mandating it to become the global broadcaster of integrity. Finally, it proposes additional policy ideas as part of the ongoing debate about Global Britain. These include strengthening relations with the “Anglosphere” (and other Commonwealth nations), a renewed commitment to supporting multilateral institutions, and suggestions for making British democracy more resilient. Does the report argue for a reduction in spending on “international development”? No. The report argues that spending on “international development” should remain at 0.7% of UK Gross National Income, as mandated by the 2015 Act of Parliament. What the report does argue for is for a rethink about how “international development” is defined. It is currently defined as “Official Development Assistance” (ODA), a definition established some fifty years ago, in 1969. ODA is almost exclusively defined as economic development. This is increasingly problematic. Insofar as authoritarian states are seeking to spread autocracy and revise the rules-based system, the time has come to broaden the meaning of “international development”, so that countries like the UK can fight autocratic revisionism in developing countries. In particular, Britain needs the ability to project the narrative of openness and liberty to the world using a reinvigorated BBC World Service, British Council and other platforms, not least when well-funded and slick new competitors like Russia’s RT and Iran’s PressTV spread their regimes’ warped and destructive perspectives. Is this report the foreign-policy position of the Henry Jackson Society? This report is just one of many contributions from across the political divide to the Henry Jackson Society’s ongoing series of educational papers on the future of “Global Britain”. It is intended to contribute to the ongoing public debate over the future of the United Kingdom and its role on the global stage. The views expressed in this publication are those of the authors, and are not the corporate views of the Henry Jackson Society or its Trustees. The report was launched at a parliamentary event in the presence of two Members of Parliament on 11 February 2019. Some of the questions from the audience were directed at both members and the resulting discussion inevitably addressed the subject of Britain’s relationship with the European Union. The Henry Jackson Society does not take a corporate position on this issue, and has indeed avoided doing so in the past. Consequently, the report makes no advocacy nor recommendations towards the question of Brexit. Any views expressed in the event were those solely of the speakers. If viewers and readers would like more educational information on all the possible Brexit options, including the possibility of Remaining in the European Union, we can recommend the comprehensive and objective academic analysis provided by UK in a Changing Europe.